So how are we teaching our kids? This is a rolling list of things. Sort of trial and error depending on their level of understanding and how they learn. Prayer // Seeking wisdom from the Lord as to how our children learn and what works best for our family. Example // Can’t teach what you don’t have, right? That’s a little hypocritical. So it’s important for us to set an example. To see us learning and growing in our faith walk. To see us loving and serving others. That’s important! With kids that are 4 & 2 it’s not always easy to have this picture perfect “quiet time”. But there’s a teachable moment in every detail of our lives! Music // How easy it is to learn scripture with a tune? I cannot say enough good things about Seeds Family Worship. The songs are beautiful and easy to remember. When you are having a meltdown in your car and your 3.5 year old starts singing scripture to you….I’ll take it! Books // Of course the Bible. The kids both have the Jesus Storybook Bible and we’ve probably read through it 5-8 times total over the last 4 years. My kids both love books (they take after their mama) so we try to read as much as possible. My list for books is seriously ever growing. I try to get most of them through the library but some books are worth purchasing and having for years to come! There are so many resources for books and it’s easy to have books that are repeats. Trying to diversify the choices but them all still being pointing to truth about God is important. The World Jesus Knew: A Curious Kid’s Guide to Life in the First Century // Honestly this book was more for me. But it’s soooo interesting. The Biggest Story ABC // I don’t think we have enough alphabet books but this one is a great one! It’s easy to read, colorful, and biblical! The Biggest Story: How the Snake Crusher Brings Us Back to the Garden // The art work that went into this book is truly remarkable. It’s gorgeous. The Donkey Who Carried a King // It’s Sproul, so you know it’s good. My ABC Bible Verses: Hiding God’s Word in Little Hearts // This book is probably for ages 3-4+. But it gives you a memory verse based on a letter and then a simple story to explain the point to your kid. 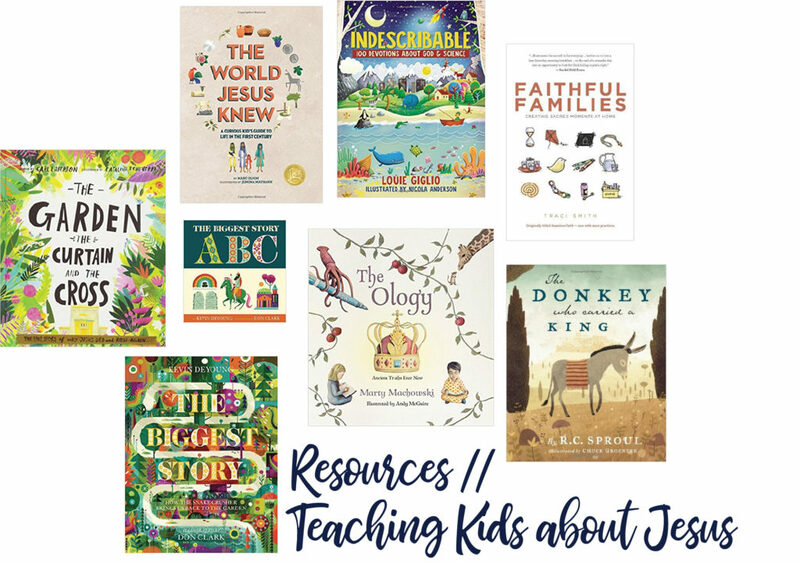 The Jesus Storybook Bible // Great bible for kids. There’s even an advent reading plan! I love this! Your list of resources will come in handy for me when my son gets a little older (he’s 5 months now!) but he’s definitely beginning to follow along while I read to him! I love how you included music as a way to teach them about Jesus. Its so easy to assume that just by taking them to church that they will have enough. Love your blog and this post! Thanks! Glad it’s helpful. Seeds Family Worship is great and the music is scripture but also really nice, easy to listen to and sing along. Keep on reading to him. Our boys love books and they’ve been read to since I was pregnant. Seeds Family Worship music has been so wonderful for teaching scripture. We love it! These are some wonderful ways to teach our children! Thank you for sharing. I really enjoyed this post. Mu little guy is still under one but I know I’ll need tools like this once he’s old enough to understand. This is so helpful Lacey thank you for sharing! !